With my time in the south coming to a close, I decided to make the most southern thing I could think of. While this is one of the few times I'm not using buttermilk, this dish is full of southern goodness: peaches, bourbon, pork, and hot sauce. 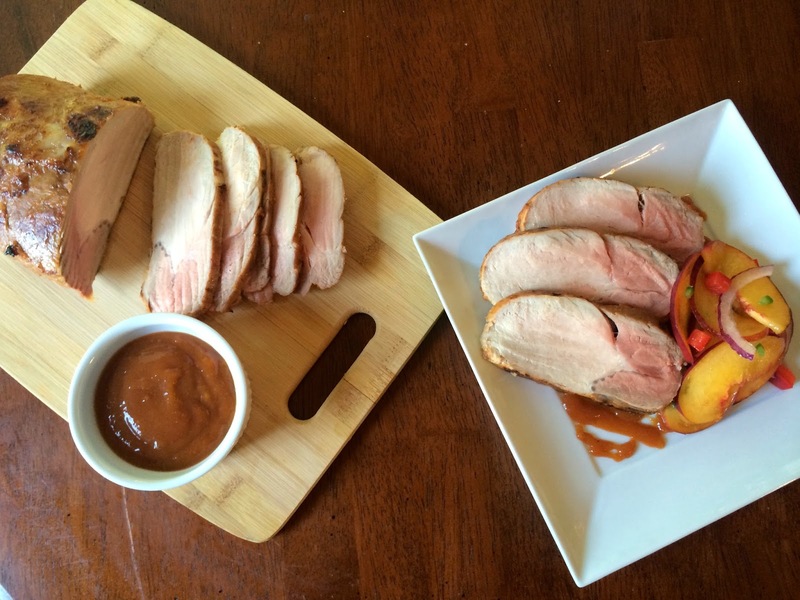 Peaches in a savory dish might sound a bit odd, but they add a unique sweetness to the barbecue sauce, which I marinate the pork in and drizzle on top. 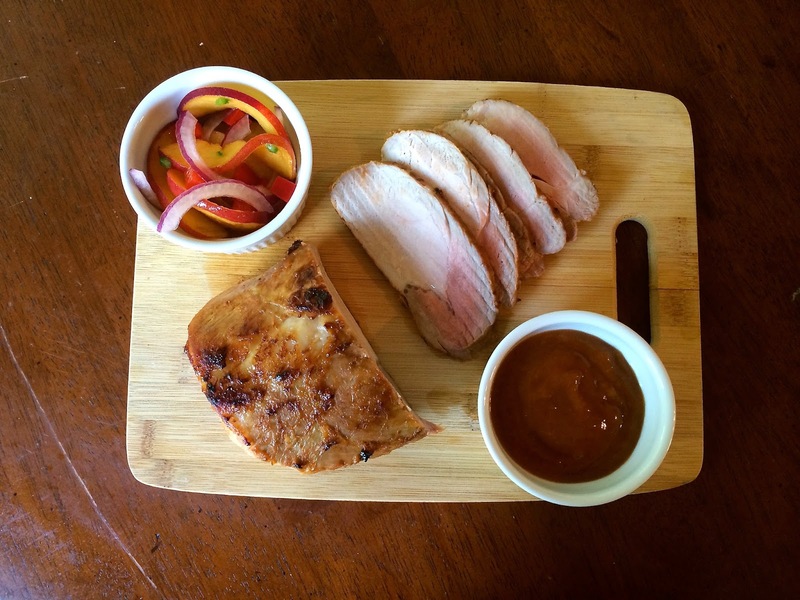 Although I chose to roast a pork tenderloin, you can use the barbecue sauce on anything you want (I think chicken would pair well with it in particular). If you've visited my travel guide, you know I have a soft spot for Kansas City barbecue, specifically the sweet tomato-based sauce. Since this barbecue sauce has peaches and bourbon, it doesn't exactly adhere to a specific region. It's not North Carolina vinegar-based or Alabama white sauce. It's a unique sauce with a tomato base, some sweetness, some vinegary tartness, and a hearty punch of bourbon. The sauce, like most barbecue sauces, is pretty easy to make. I saute some garlic and onions (in butter; more southern influence), then I add a full pound of peaches, usually about two large ones. Even though you could probably use frozen peaches, I wouldn't recommend it. I spend a few minutes peeling them for a smoother texture, but that's not entirely necessary if you don't mind some bits of skin. After the peaches soften a bit, I add the liquid ingredients: ketchup, vinegar (cider vinegar is best here), some honey and molasses, some mustard, some worcestershire, and hot sauce to taste. I add some brown sugar for extra sweetness--you can adjust the amount based on how sweet your peaches are--and also the bourbon (of course). 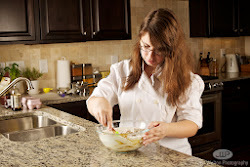 After that simmers together for a while, just puree it with an immersion blender, regular blender, or food processor. I use a little less than half the sauce to marinate a 1.5 to 2 pound pork tenderloin. The longer you let it marinate the better, but I find that 3-4 hours is enough to flavor the pork without taking all day. Once it finishes marinating, I sear it in a big skillet to start caramelizing the outside. The pork develops a wonderful crust because of all the natural sugars from the peaches in the sauce/marinade, but you do have to keep an eye on it because it will burn fairly quickly. Unless you use small medallions of pork or other pieces of meat that will cook quickly, you're going to need to finish the pork in the oven. Searing alone won't cook a whole roast all the way through, and you really don't want to eat raw pork. I transfer mine to a baking dish instead of sticking the whole skillet into the oven because the sauce/marinade/drippings will burn and give the whole dish a bitter taste. It only takes about half an hour to cook at 425, so this definitely isn't one of those all-day roast dishes (though maybe it is if you count sauce-cooking and meat-marinating time). Once the pork is out of the oven and has rested for a few minutes (yes, you should try to wait a bit before digging in; the meat will be much juicier and I promise it won't get cold that quickly), I slice it with a sharp knife or one of those electronic carving knives and serve it with the leftover barbecue sauce. I also made a small salad to serve on the side. You can make potatoes, asparagus, or whatever your favorite vegetable is, but I had some extra produce and decided to toss it all together. I combined sliced peaches, sliced red onion, diced bell pepper, and minced jalapeno. The peaches in the salad highlighted the peaches in the sauce, and the red onion added a nice sharpness that cut the richness. The bell pepper was mainly for crunch, and the jalapeno added an extra kick that complimented the heat in the sauce. It seems like an odd combination, but I wanted to bring out the flavors of the pork. This is a great dish to make for a crowd since the preparation is the same for any size (although you might want to marinate it and definitely cook it longer). 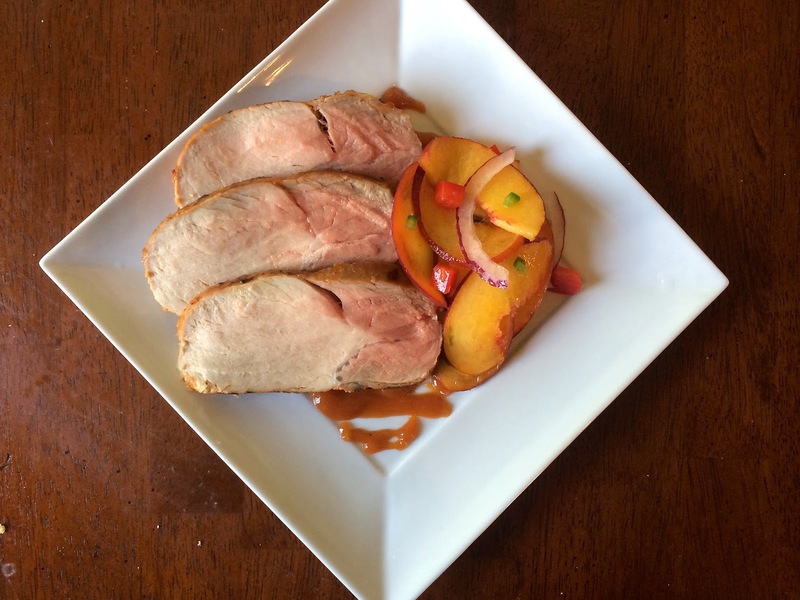 I think that peaches and pork are a great combination, and if you don't believe me you should try this recipe just to check. Heat the butter in a medium pot over medium heat. Add the onion and cook for 4 minutes or until translucent and tender. Add the garlic and cook for 1-2 minutes. Stir in the peaches and brown sugar and cook for 2 minutes. Season with salt and pepper. Add the ketchup, bourbon, vinegar, honey, molasses, mustard, and worcestershire. Add hot sauce and cayenne to taste. Simmer for 15-20 minutes or until thickened, stirring often. 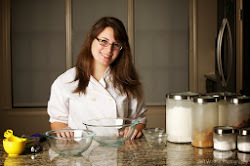 Puree with an immersion blender or food processor. When cool, pour half the sauce into a bowl or large ziploc bag. Add the pork, toss to coat, and chill for 3-4 hours. Heat some oil in a skillet. Wipe the excess marinade off the pork and place in the skillet. Sear on all sides until browned, about 3 minutes per side. Transfer the pork to a baking dish and roast in the oven for 20-30 minutes or until cooked through. Serve with the reserved barbecue sauce.